From the Google Blog, "Every time you send a text, check a webpage or post a status update, you are using open source software. The Internet is made of open source. But have you ever created any yourself? If you’re a pre-university student between 13 and 17 years old, now you can—and win prizes along the way. Our Google Code-in contest starts this coming Monday, November 21, and you can sign up now. During the contest, which lasts for 57 days, participants can work on cool online tasks for 18 different open source organizations. Possible challenges include document translations, marketing outreach, software coding, user experience research and a variety of other tasks related to open source software development. Participants earn points for each task they successfully complete and can earn prizes like t-shirts, cash and certificates of completion. The ten participants with the highest points earned by the end of the competition receive a grand prize trip to Google headquarters in Mountain View, Calif. next spring for themselves and a parent or legal guardian. 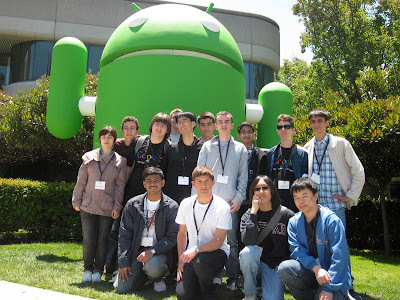 They’ll spend the day getting a tour of campus, meeting Google engineers and enjoying other fun surprises. Last year’s Google Code-in had 361 students from 48 countries completing 2,167 tasks over the course of the the eight-week contest. We hope to have even more students participate this year. Help us spread the word by telling your friends, classmates, children, colleagues, teachers—everyone! If you’d like to sign up, please review our Frequently Asked Questions and the contest ruleson our program site. You can also join our discussion list for any other questions. For details on important dates for the contest, see the timeline. You can go ahead and register for your account now on the program site so you will be able to start claiming tasks right away when the contest opens on Monday, November 21 at 12:00am (midnight) PST. Posted by Stephanie Taylor, Open Source Programs"